Red-eye is a common problem with flash exposures, particularly if the flashgun is mounted on the camera or flash is used in dark conditions. The effect is caused by flash light reflecting off the subject’s retina at the back of the eye (this is reddish in color). You can avoid or reduce the problem by using bounce flash or by moving the flashgun some way from the lens axis, but often enough, the damage is already done, and chances are the occasion -typically a children’s party – can’t be repeated. 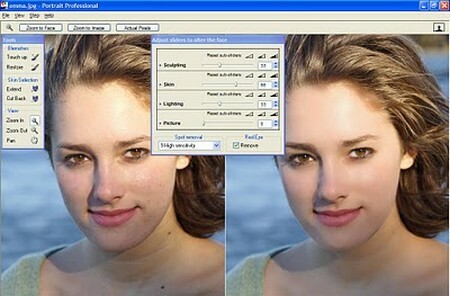 However, help is at hand in your digital toolbox, which offers several easy ways to restore normal color to the eyes. Found in some, but not all, applications, this is nothing more than a specialized desaturation brush that you drag across the affected eyes. Unlike conventional desaturation tools (which desaturate all colors in the image), the Redeye tool desaturates only red. You need to use the tool precisely. Make sure that the brush covers only the red pupil; as the iris and skin already have red components, overzealous use can produce localized monochrome results. Dedicated redeye tools are usually best for shots that contain many red eyes, such as a party group, rather than individual shots where you need to work more precisely. Greater accuracy and, ultimately, greater authenticity, can be achieved by a manual correction. Use the Magic Wand (with a tolerance of around 20) to select the red parts of the eye). Don’t worry if the white highlight is also included. Use the Desaturate tool to remove the red. Sometimes the redeye is so bright that, when desaturated, the pupil is a light grey color. Depending on how light the grey, increasing the contrast of the selected area may make the pupil color more authentic. In extreme cases it might be necessary to use a dark grey paint color to fill the selection. In this case, ensure that any white highlight in the eye is not part of the selection. Watch out for similar effects if you use flash to take pictures of animals and pets. Dogs are prone to exhibit greeneye, and cats whiteeye or yelloweye.